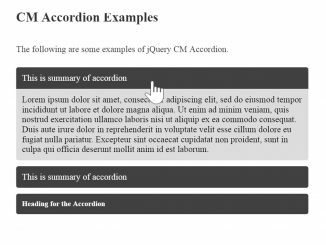 A lightweight, cross browser and easy to use jQuery plugin to create / add Responsive Vertical Tabs to Accordion. It supports multiple sets of tabs on same page and link directly to specified tab. 2. Create the HTML for Tabs structure like below. 3. The following is the nested tabs structure. 4. And finally, initialize the plugin in jQuery document ready function (with default options). The following are some advance configuration options to customize the working of the plugin. tabidentify: 'tab_identifier_child', // The tab groups identifier *This should be a unique name for each tab group and should not be defined in any styling or css file.